The results of a recent survey commissioned by the NFU have revealed that the farming industry in the UK has a more positive image in the public eye than it has for many a year. The overall results show that 67% of those quizzed think of farmers in a positive light and that 90% state that they understand the importance of farming to both the national economy and conservation of the environment. Farmers may be amused or bemused by the revelation that their image, though not quite that of a super-hero, is fast becoming synonymous with subjects which are of contemporary concern to the majority of us, from food safety and compassionate farming to national identity and the beauty and benefits of the British countryside. This all comes hot on the heels of the news that Wales may have found it’s first “celebrity” farmer in Gareth Wyn Jones. Gareth and his farm were the subject of the BBC Wales TV series The Hill Farm which aired earlier this year,and has been nominated for a BAFTA . As well as this, Gareth has been selected as one of the finalists for the Farmer’s Guardian Hero Award. His inspirational use of social media highlighting the plight of the farmer during the flooding which affected much of the country earlier this year led to the relaxation of EU rules , and is recognized by his inclusion on a shortlist of seven remarkable farmers. Gareth, whose ancestors have farmed at Ty’nLlwyfan in Llanferfechan, Conwy for over 350 years, has been featured several times on Welsh TV in the past, regularly blogs and has published an autobiographical book in Welsh. But it is the reality series following him and his family in their day to day lives as farmers which captured the imagination of Welsh viewers. His aim was not publicity for himself, he says passionately, but to promote the industry and make the public aware of exactly what it is to be a farmer in 21st century Britain. 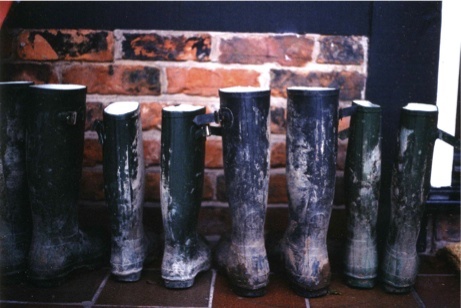 Farming today is about more than wax jackets and wellies (although they are still a part of any farmer’s life in Britain’s inclement weather!) and the agricultural community’s contribution to the economy and the environment is being acknowledged more and more by Joe Public. Despite rough treatment by the supermarket giants in the past, they are responding to the demand for home-bred and home-grown quality produce and the consumer is keener than ever to support the UK farmer by buying British. As for farmers as individuals, they are being encouraged to follow in Gareth Wyn Jones’ footsteps by creating their own websites, writing their own blogs and using social media to engage with the public and encourage a mutual atmosphere of respect and understanding. Mab Y Mynydd (The Hill Farmer) by Gareth Wyn Jones is already available in Welsh and will be published in English, with an update recounting the flooding of the Somerset Levels, on October 25 2014. Previous Previous post: Want To Achieve Your Business Goals? Communicate!